I read this article and found it very interesting, thought it might be something for you. The article is called Single Serving Low-Carb Zucchini Noodles with Creamy Garlic-Parmesan Roasted Red Pepper Sauce and is located at https://www.anediblemosaic.com/single-serving-low-carb-zucchini-noodles-with-creamy-garlic-parmesan-roasted-red-pepper-sauce/. Whip up this Single Serving Low-Carb Zucchini Noodles with Creamy Garlic-Parmesan Roasted Red Pepper Sauce in 20 minutes when you’re craving a lighter, but every bit as satisfying, version of pasta! I was so ridiculously late to the zucchini noodle game that I don’t even know how I dared show up at all. I was so late I thought it in poor taste to even refer to them by their nickname (zoodles! ), preferring to keep it more formal in my shame and call them zucchini noodles, lol. When it comes to the zoodle party, I basically just snuck in the side door hoping not to draw attention to myself, but then couldn’t contain my excitement and had to announce that a) I’m unfashionably late to the party, and b) I suddenly understand what all the hype is about. My reasons for holding out were tri-fold and silly. The first one was that I am always a latecomer to jump on new trends (I don’t even own an Instant Pot, although I do have a much less fashionable slow cooker and stovetop pressure cooker). I thought it was hard to use (I actually got a Spiralizer a while back, tried it once, wasn’t great at it, and never tried it again! Oh, the silliness. It actually couldn’t be easier to use, I just wasn’t applying enough pressure). And lastly, I thought a vegetable replacement for noodles couldn’t actually taste good; how wrong I was! Not only are zuke noodles tasty and satisfying (waaaay more than regular old noodles, by the way), but they’re every bit as versatile as regular pasta and easy to make. If you have no idea which one to buy, I use this Spiralizer and find it very easy to operate. Another tip I have for making zucchini noodles is that there is no need to cook them! If you’re serving them hot, the heat from the sauce is enough to warm them. Otherwise, they can get mushy quickly, which no one wants. Zucchini noodles are the perfect meal for one when you aren’t sure what to make for dinner. A medium-ish zucchini is a pretty generous serving and a flavorful sauce can be whipped up in about 10 minutes. Here I went with a rich and velvety cream sauce redolent with garlic and Parmesan and studded with roasted red pepper. Sort-of like an alfredo sauce, but not quite, yet every bit as delicious. Have you joined the zoodle party yet and if so, what’s your favorite way to sauce them? Heat the butter in a small saucepan over medium heat. Once hot, add the onion and cook until softened, but not browned, about 3 to 5 minutes, stirring occasionally. Add the garlic and cook 30 seconds more. Whisk in the broth and bring to a simmer, and then whisk in the cream cheese until smooth. Let it cook a few minutes until thickened slightly and then whisk in the Parmesan until smooth. Whisk in the roasted red pepper and black pepper. Place the raw zucchini noodles in a bowl, pour the sauce on top, and serve immediately with any garnishes you like. 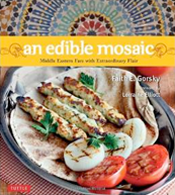 Disclosure: This post contains Amazon affiliate links to products I believe in, which means that even though it doesn’t cost you anything extra, I will receive a small amount of money from the sale of these items, which helps me keep this site alive – thank you for helping to support An Edible Mosaic! Does the sauce reheat well? This sounds like it would make an excellent lunch. Dani, I reheated the sauce and zucchini together in the microwave and the sauce was fine! The zucchini got a little softer, so if possible, I’d wait to combine the sauce and zucchini until after the sauce has been reheated. Hope you enjoy!